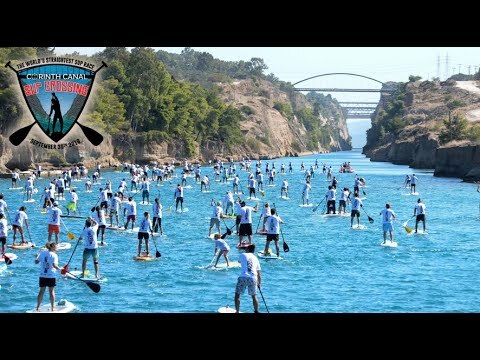 On Sunday September 30th 2018, the naval traffic of the famous Corinth Canal will be stopped by AEDIK, to allow for more than 300 stand up paddlers to compete in the "World’s Straightest SUP Race.” One of the most fascinating SUP races of the year, the Corinth Canal SUP Crossing will take place at the famous Canal of Corinth. The race is so special, not only for the high caliber of competition, but also for the emotions that overflow every paddler when he/she stands inside this historic canal, between its 80m vertical walls. The view is truly a spectacular one. The Corinth Canal is a unique monument around the globe and only few have the privilege to cross it on a stand up paddle board. For eight consecutive years, the Corinth Canal SUP Crossing race (formerly known as “Isthmus Speed Crossing”) has been the most interesting for paddlers all around Europe and the Globe, who travel to Greece for this opportunity. Live the experience of paddling the 6.343 meters through history.